When production of natural gas from the giant field off the coast of Groningen in Holland began in 1963 the energy supply to the EU’s then 6 member nations was changed markedly. 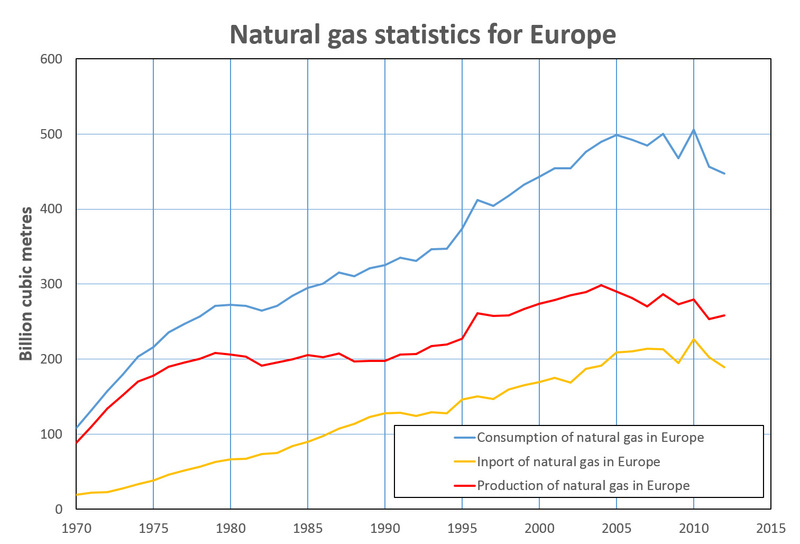 Natural gas began to become an important component of the EU’s energy security. In 1970 the EU’s consumption of natural gas had increased to 60 billion cubic meters (bcm) annually and 99% of the gas used was produced within the then EU. Today the EU has expanded to include 28 nations and its consumption of natural gas has increased to all of 450 bcm per year. The fact that only 32% of today’s consumption is produced within the EU means that its energy security has radically worsened. Many of the new member nations were previously completely dependent upon imports from Russia for supplies of gas. It is apparent that the EU’s politicians overlooked energy security in their zeal to expand the union. Recently The Economist magazine organised a symposium on Europe’s energy future and I was invited to participate on the panel discussing future sources of energy. The themes for the discussion were, “Where will Europe’s future energy supplies come from?” and “Is shale gas a meaningful energy source for Europe?” These are questions that our candidates in the EU Parliamentary elections should have opinions on since, without secure sources of energy, Europe’s future is limited. If our various forms of energy use are expressed in a single type of unit – millions of tons of oil equivalent (mtoe) – then we find that Europe’s dependence on oil is clearly larger than our dependence on natural gas. Oil and gas consumption is of the same order while nuclear energy use is half that from coal, or natural gas. Hydroelectricity and other renewable sources of energy together contribute as much as nuclear energy. If to sum together hydroelectricity and other forms of renewable energy then these amount to approximately 11% of Europe’s energy use. Of the energy that Europe (the EU, Iceland, Norway and Sweden) uses – fossil and nuclear – 60% is imported. Relative to our energy import needs, current renewable energy production is approximately one tenth. During recent years we have seen strong growth in renewable energy production and if we assume further growth of 10% per year until 2020 then renewable energy (excluding hydroelectricity) will by then be equivalent to 20% of current energy imports. Renewable energy cannot secure Europe’s energy future by making it energy self-sufficient. In recent years the EU’s importation of coal has increased and this is not good for the climate. From a climate viewpoint, increased renewable energy should be used to reduce the rate at which our coal imports are increasing but them our need to import gas, oil and uranium remains. 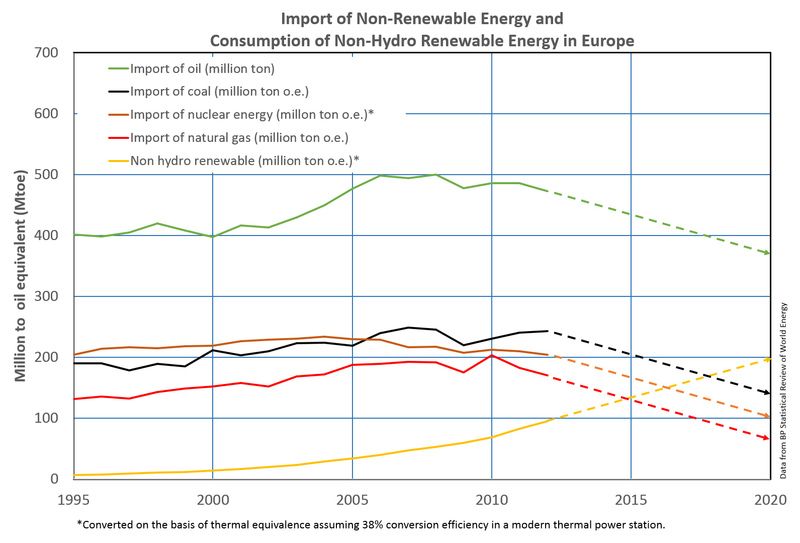 If increased use of renewable energy is to be used to phase out nuclear energy then the need to import fossil fuels will remain instead. The fact that production of oil and gas is declining in the North Sea means that we will have a continued need to import these fuels although oil use is currently decreasing somewhat. To analyse the possible significance of shale gas for Europe, Uppsala University has collaborated with the University of Texas in Austin to study what is required for Poland to become self-sufficient in natural gas production. We found that during the coming 5 years Poland must drill 400 new wells per year and then 300 wells per year thereafter. In total, thousands of wells will need to be drilled but the number is nevertheless smaller than the approximately 17,500 wells that have been drilled so far into the Barnett Shale in Texas. Our conclusion is that shale gas cannot solve all of Europe’s gas importation needs but that it may help Poland if they choose to drill thousands of wells. There is one nation on Earth, Russia, that will never need to import any form of energy and that, in contrast, will be able to export fossil energy for many years. Today it is difficult to imagine that any other nation might substitute for Russia as a supplier of energy to the EU and Europe. Many years ago at a conference in Poland on Europe’s natural gas security, I expressed the view that Russia should become a member of the EU. That would be the only way for the EU to ensure its energy security in the longer term. Today that possibility seems remote but the idea that the bitter enemies England, France, Italy and Germany would one day be members of a European union for peace was also once far-fetched. My old historical atlas shows that Europe’s eastern border is the Ural Mountains. Over indulgence of rubber tire transport will hasten economic woes for EU nations just as it has cost the USA untold volumes of blood and treasure, still counting day by day. Making deal after deal with questionable business partners whether individuals or nations ALWAYS turns sour. Since the Suez crisis Russia has chosen to be aligned against Israel, and refuses even after many decades. to understand their folly. Even as Russian troubles with Mohammedanism inside their borders mount, Russia again teams up with China in their quest for oil. This will end with a mighty crash. EU nations are too tightly bound to the rubber tire economy and seem absolutely unable to perform even token reknitting of the local railway component. America, with much original rail corridor preserved in the “Rails To Trtails” program, still has ability to pursue an eleventh hour “Trails To Rails” turnabout. It remains to be seen how much needed nerve and skill can be summoned! Right now it still seems unwise to bet against the United States Of America. EU nations seem too sophisticated (stubborn) to bring cargo railway back into the urban environment. Personally, I find that the constant struggle over oil and gas redundant at best. Although the commodity is need currently, there is not a need to continue to be dependent on only oil and gas. Renewable energy sources, particularly solar have vast potential to offset the need for oil and gas. I believe that the continued dependence on these resources is entirely political at this point, furthermore it what is really sickening is that that majority of this dependence comes from the oil companies themselves and their continued unchecked and unchallenged authority over some of our political leaders.